HAUPPAUGE, NY -- CIRCOR Aerospace, Inc., a CIRCOR International company (NYSE: CIR), has announced its latest product innovation, a patent-pending aspirator manifold. Aspirators are used for emergency device deployment such as life rafts, emergency slides and other flotation devices. This unique manifold is an ejector-jet pump which mixes compressed gas and atmospheric air into an exhaust port to inflate an evacuation device. 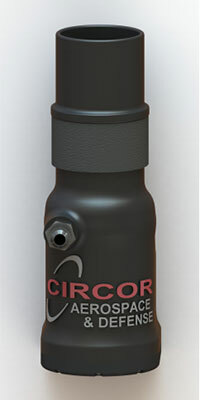 The CIRCOR Aerospace, Inc. product is based on the simplified manufacturability of the manifold. The entire construction is fabricated by 3-D printing – a single piece eliminating the need for machining, brazing or welding techniques of conventional fabrication. The new construction technique has additional benefits: the product is flexible in design configuration, extremely light weight, inflation rates for the evacuation device are increased, and the inflatable device requires less high pressure gas to inflate. “The Survival Solutions product line is synonymous with high reliability inflation systems. CIRCOR is proud to bring this innovative design to market which will meet and exceed our customers’ needs for survival products,” said Aaron Landrum, NY General Manager. Special mentions go out to the aspirator engineering team: David Gass, Engineering Manager; Robert Seibert, Senior Project Engineer; Brian Hickey, Senior Project Engineer; and Project Engineers Chris Lovasco and Russell Sirvis.